It's the Blogger's Quilt Festival! 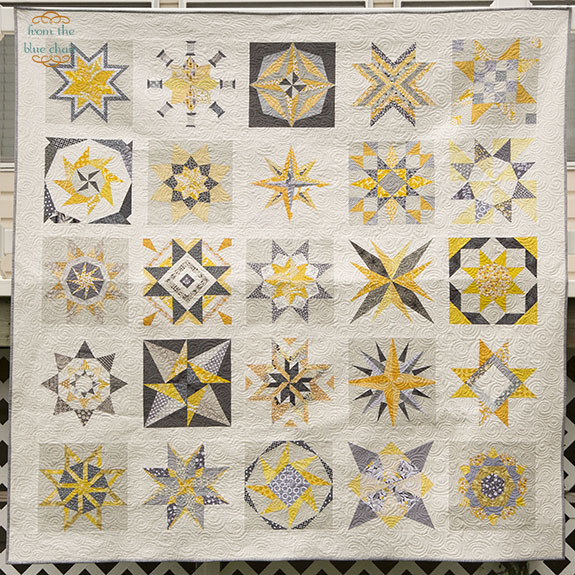 I'm entering my Stars Quilt into the Bee/Group quilt category. You can view my other entry here. This quilt was a combined effort from about 20 other women from two bees in which I was participating. I made six additional blocks to complete the layout. I was so happy with how it turned out. These blocks sat in a box for more than a year while I decided how to actually arrange them. I posted my dilemma on Instagram. Someone commented with the suggestion to do one or two blocks with a dark gray background. It was an idea I hadn't considered, but I love how it worked out. Those blocks with the dark backgrounds really give the quilt personality. I chose to quilt this with all over swirls to soften the lines of the blocks and pull everything together. I gifted this quilt to a friend after her father passed away. I'm happy knowing it will be loved and hopefully gave her comfort during a difficult time. Absolutely gorgeous, Kati! Love the quilting. So many of the Lucky Stars blocks in there too. Great job. Oh yeah, I didn't really think about it until you mentioned it but the darker background ones really add a lot! Loved this quilt when you first showed it. What a generous soul you are. Hope you win! What a sweet story. I am sure it will give her comfort. It's gorgeous! Kati this quilt is beautiful, the restricted palette coupled with the various blocks works so so well. Well done to all the bee participants and yourself of course! btw isn't instagram great for quick feedback. This is beautiful. 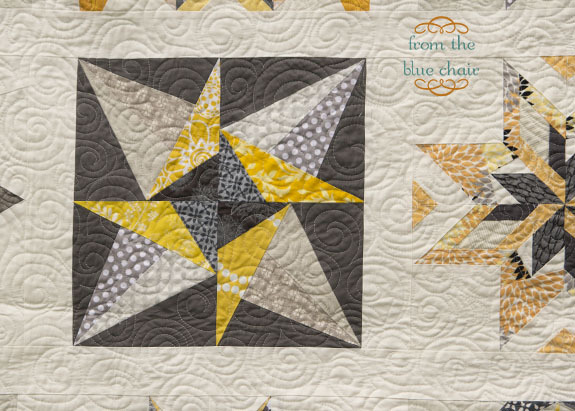 I agree about the dark grey backgrounds, and the quilting really finishes this quilt wonderfully. A fantastic present for your friend. Beautiful sampler! I love the muted colors and the swirls give it a wonderful texture. Such a beautiful quilt. What a wonderful gift for your friend. Beautiful! And your quilting looks amazing! I assumed you sent it out to be quilted until you said you did it yourself. Beautiful quilt, lovely precise piecing and wonderful quilting. I'm sure it is loved and treasured by a dear friend in need.